The magic window has been improved, displaying level of progress in the different schools of magic. Also research of spells is now constrained, and a selection of spells are available based on progress in relevant schools of magic. Jungle graphics have also been added. Another small update, this time with expanded mythos generation. Pantheons can now be other configurations than beasts of various domains (use Cheat->Show Pantheon to inspect). Also, there is a bunch of new settlement graphics. A small update fixing damage on ranged attacks in tactical combat. It was annoyingly low, often 0. I also added a selection marker showing what unit is selected, and a health bar on each unit. This update has a few different things in it. Interactive combat has been improved a bit. The AI is now better, and ranged attacks now function properly. There are still lots of work to be done in making it more user-friendly and informative, but it is usable now. Also, when a battle occurs you can choose manual control, watching the AI control it, or “silent” auto-resolve. There is a keyboard shortcut for next turn. Press ‘N’ to advance to next turn. Also a drop-down + button near the main map for quick access to spellcasting. Also, sites have a button for showing details about the people inhabiting them (“View Culture”). I have started work on interactive dungeons. As of now sending a hero to a dungeon will result in an AI-automated exploration and battle, and a message telling that your hero defeated a zombie bat, or whatever it was. After testing, I have decided this is simply too dull. But I also do not like the approach many fantasy strategy games take where your hero brings an army to battle the denizens of a dungeon and it is resolved like any other battle. Instead I aim for something like this: When exploring a dungeon, you get a map of the dungeon, and get a certain amount of action points for moving your hero around in it. When a challenge is encountered you get the option of how the hero deals with it. Monsters can be fought, sneaked past, pickpocketed, fled from, parlay’d with, etc. The foundations for this is in, but there is still work to do before it is fully functional. 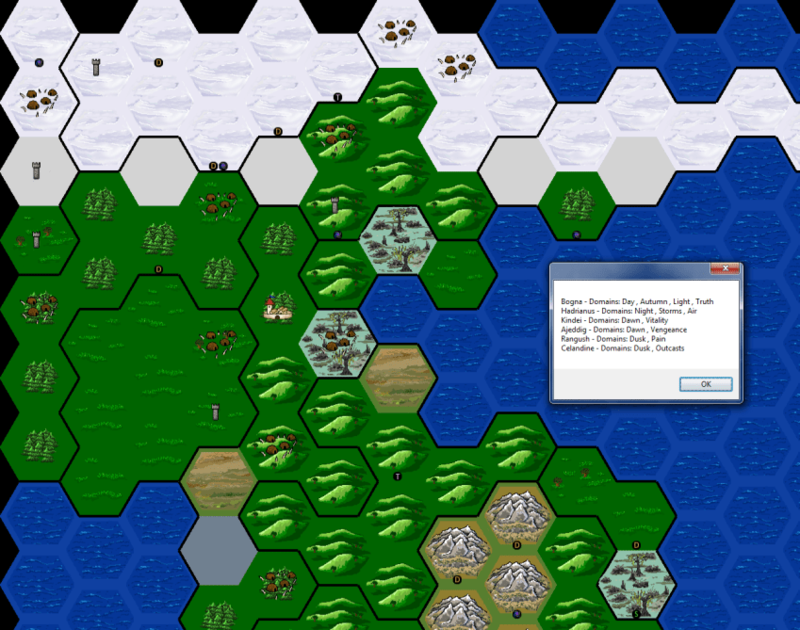 Plains hexes now have graphics, so now the map is mostly graphics, and very few plainly color hexes remain.